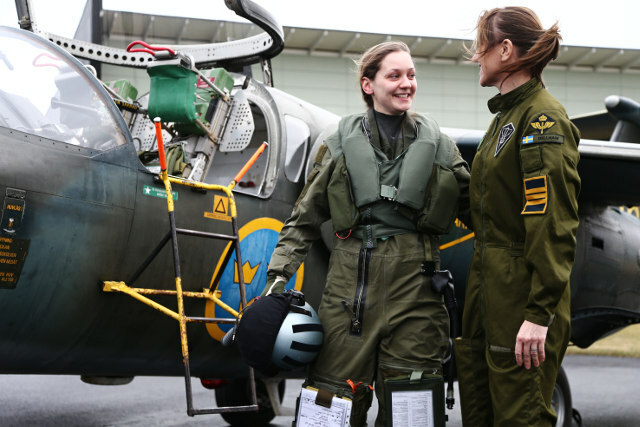 A 22-year-old has become the first woman in Sweden to graduate as a fighter pilot in 26 years. Newly graduated pilot Lovisa Sandelin (left) pictured with the first ever female to do so in Sweden, Anna Dellham. Lovisa Sandelin from Ludvika, central Sweden, graduated from the aviation school in Linköping at the end of January. But she isn't taking too much notice of the attention given to her gender. “I see it more as something personal. Getting my pilot’s wings is a big milestone for me just as my male colleagues see it is a big milestone in their lives, so I maybe don’t focus so much on the fact that I’m a woman,” Sandelin told SVT. At the same time, she also pointed out that it is important that more women apply to join Sweden’s Armed Forces and Air Force. Sandelin passed her basic education with 22 other students, and they will then have a few more years of further training to do. Eventually, they will fly the Saab JAS 39 Gripen fighter. Public perception of the profession being a typically male one could be an explanation for why so few women opt to become fighter pilots in Sweden, argues Mats Juhlander from the Swedish Air Force’s Air Combat School (Luftstridsskolan). "But it isn’t. The Armed Forces opened as an occupation for both sexes in 1989,” he pointed out. With more women now starting their training, the hope at the air school is that Sandelin’s success can have a knock-on effect and will lead to more women graduating.